Day 5: The first week’s done! What an eventful week. An enormous amount has been achieved in a short space of time thanks to the enthusiasm of a great team. Four trenches have been opened up and fully desodded. Two of these have been cleaned down to archaeology and the first clear intact contexts/features have been identified. These have been recorded over the last couple of days by drawing, photography and in writing and another series of soil samples has been taken. So if it seems that there is no digging going on in some trenches that’s true but this is essential in order to give time to properly and meticulously record everything. Detailed recording is essential at this stage and is important because once a layer or feature is dug out, it is gone forever; it is not possible to put it back and take another look. 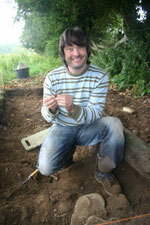 Most of the crew were transferred across to Trench 5 to give time and space for recording in Trenches 1 and 3. This is c. 1.5m out from a whitethorn hedge and contains the greywacke slab I spoke about before. The hedge is great because it is quite old and well-developed and it means that the crew was working under a natural umbrella. There were only a few showers on Friday but the foliage is so dense that it remained perfectly dry underneath. The suspicion about the slab is that it is not resting in its original position. It is lying embedded in the ground lengthways, parallel to the field boundary/hedge and protruding at an angle from the ground along its width. The upper surface has a series of grooves cut into it (see the third Day 3 photo). This is not ogham nor is it megalithic art (unfortunately) but is damage from metal ploughs being repeatedly dragged across that point of the slab, year after year. It looks like the slab was originally buried in a tillage field just at the base of the ploughsoil and one year, instead of scraping over the top edge of the slab, the plough caught it and pulled it up. The ploughman then pulled the stone to the side of the field out of the way and it made its way to its current position. Because the stone is at the top of a slope in its current position, it looks like it may have been thrown through/over the hedge from the field next door, i.e., the field where the centre of the Rossnaree Enclosure is located. Perhaps there was a standing stone in or close to the centre of the site. The field where the stone is lying was itself cultivated in the past. Indeed on the lidar imagery (see the background of the montage image on the home page) the field has a clear ‘corrugated’ surface showing the line of cultivation ridges. Because of this, it looked like the stone was ‘floating in at at the top of cultivation soil rather than being bedded into an archaeological feature below the surface. However, as this was only a theory, the safest approach was to excavate the disturbed cultivation soil from around the stone to expose the base and check what it was lying in. This is what we did and by Friday evening, although we hadn’t reached the base of the cultivation soil, we had exposed the bottom edge of the stone and were able to determine that it was lying completely within disturbed cultivation soil and was not in its original position. Thus it is safe to lift the stone and arrangements are being made to do this using appropriate equipment. It is definitely too big to lift and transport by hand. A nice selection of finds came from the area including several pieces of flint, some chert, a lot of animal bone, lots of bits of barbed wire and, best of all, a portion of a lignite bracelet. This was definitely find of the week although there was some speculation that it was ‘…just a bit off a tractor..!’ Maybe they’re right! If it is a lignite bracelet, it could be either Bronze Age in date or Early Medieval. Either way, it is likely to have been a prized personal possession of an individual and it is amazaing to think that a portion this big survived so well for so long in a very dynamic context, i.e., soil that was ploughed or cultivated every year for possibly centuries. As usual, all spoil excavated from the trench was passed through a 5mm sieve. 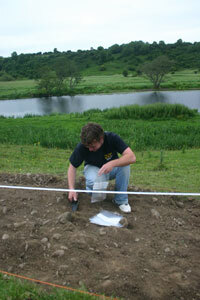 It was very useful using the sieve as this is how most of the finds were identified. A different sieve arrangement was used to that used for Trenches 1 and 3. This is designed to be suspended from some sort of frame but was used without a frame here. Thanks to Emmet for both designing and manufacturing the sieve to such a high standard. The handles are a particularly nice feature! The relief crew: Clíodhna and Cillian 'will work for biscuits'! The work on Trench 5 progressed very well and we were joined for a short while for a new crew of volunteers who negotiated payment for their efforts in the form of biscuits! Come to think of it, that’s what the rest of the volunteer crew are working for too, thanks for pointing that one out to me Eamonn. I suppose it’s better than working for peanuts! Being the end of a week, we unfortunately had to say goodbye to some of the crew. Ailbhe had left on Thursday evening for Oxigen (we hope it doesn’t rain too much!) and then Valerie and Andrew finished on Friday evening although there is a strong possibility that they may be able to return for a few days later in the dig. The bug has really bitten there. A big thanks to them for taking part and helping to make the week so stress-free and enjoyable – I think we all learned a lot as the days went by.